Now that Article 50 has been triggered and the formal process of leaving the European Union is underway, the question turns to what sort of relationship the UK will have with the EU after 2019. Before the referendum, one of Vote Leave’s biggest strengths was that people with vastly differing views (from Daniel Hannan to Arthur Scargill) were able to project onto the “change” option the type of change that they wanted to see. Now, however, Brexit must take on a specific shape and form so Opinium, with our colleagues at the Polling Matters podcast, looked at what the priorities should be for the eventual deal. What the survey questions were designed to do is, in a way, find the breaking point at which leaving the European Union is no longer worth doing. Back in 2013 we produced a report which argued that a majority of British voters wanted to leave the EU if it was a relatively cost free option. Vote Leave’s success came in part because it was able to undermine the credibility of the economic forecasts and present Leave as a way of reducing immigration without any significant economic hit. Although key ministers have recently made more conciliatory sounds on the issue, the direction of travel since Theresa May’s conference speech in 2016 has been clear: the priority is cutting immigration and leaving the Single Market. For Leave voters this fits with their priorities with reducing immigration being a key driver of making Brexit worth doing and leaving the Single Market or even a recession with significant job losses not offsetting this. So looking at Leave voters specifically (on the basis that Remain voters already made the decision that Brexit would not be worth it), we find that a slight majority believe Brexit would no longer be worth doing if “there is no significant reduction in EU immigration to the UK”. Interestingly in light of Nicola Sturgeon’s commitment to a second independence referendum in Scotland, Leave voters believe the end of the Union to be a price worth paying (69% saying Brexit would still be worth it vs. 14% not worth it) reflecting a feeling amongst some in England that if Scotland is that unhappy then they probably should leave. Out of nine items that we tested though, only three had a majority of Leave voters saying that they meant Brexit would no longer be worth it. One was no significant reduction in EU immigration, as mentioned above and consistent with the government’s stated priorities. The other two, however, may be more problematic for the government. 62% said that Brexit would no longer be worth if the Court of Justice of the European Union (CJEU) continues to have jurisdiction over some UK laws. 62% also said that this would be the case if the UK continued to make financial contributions to the EU budget. This is a problem for the government because Britain’s status as a net contributor to the EU budget is the strongest hand that the UK has to play in getting a good deal from Brussels. Paying into it, either directly or indirectly via specific payments to particular programmes in particular EU countries, is likely to be the main part of what the UK can offer in exchange for enough access to the EU Single Market to prevent major economic damage. Similarly, while Britain must cease to be a member of the Single Market to regain the right to restrict immigration from the EU to the UK, any Brexit deal would probably need British companies to continue to be able to export to the EU and a way of validating that their products or services meet the EU’s rules. At present they automatically do so because Britain’s laws and those of the EU are fully aligned. After Brexit, some sort of regulatory equivalence will need to happen and therefore some mechanism will be needed to arbitrate disputes with the most likely candidate being the European Court. Amongst all respondents, 57% say this would be an acceptable deal vs. 29% who object. 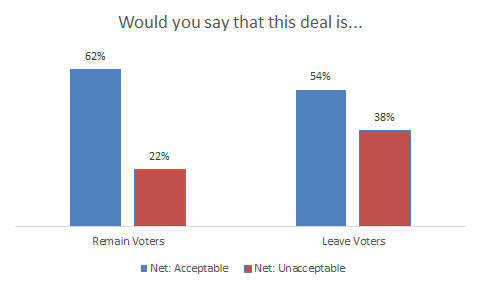 However, even amongst Leave voters, 54% say it is acceptable vs. 38% who find it unacceptable. Supporters of all parties find it acceptable and even UKIP voters, who are almost evenly split, are slightly more likely to say acceptable than unacceptable. Those of the “liberal Leave” wing may say that sovereignty, rather than immigration was the main driver of Brexit but it does seem that the voters that supported them would happily trade away the former if it gets them what they want on the latter.